Philosophy Conference Brings in Students Across the U.S. This March, Southern Utah University is hosting and celebrating its fifth undergraduate philosophy conference (SUU UPC). The conference will begin at 9:30 am in the Charles Hunter Room on Saturday, March 23rd. SUU UPC is organized by the SUU Philosophy Club, assistant professor of philosophy Kris Phillips, and professor of philosophy Kirk Fitzpatrick. Anyone interested in philosophical discussion is welcome to attend. Undergraduate students across the globe are invited to submit their academic papers to the SUU Philosophy Club. Members of the club read each paper and provide written commentary. Authors of the top selected papers are then invited to attend the on-campus conference to present and discuss their papers. This year's conference will include keynote speaker, Dr. Rebecca LeMoine, professor of political theory at Florida Atlantic University. 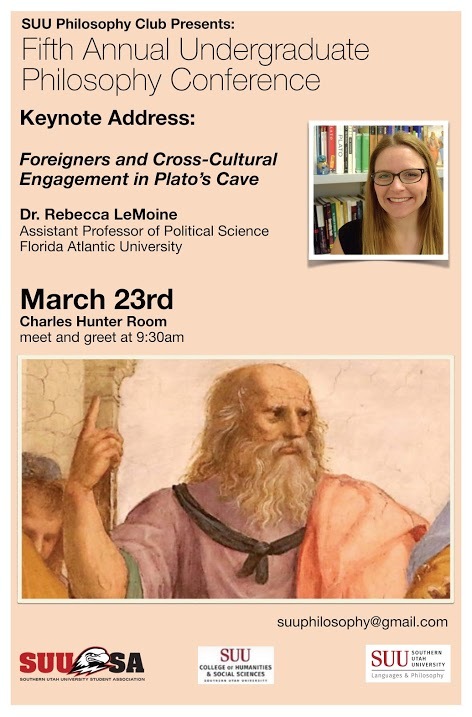 Dr. LeMoine will be presenting a paper titled “Foreigners and Cross-Cultural Engagement in Plato’s Cave”. “By bringing in students from other places, our students get to interact with those that they wouldn’t have otherwise met. It’s important to hear different perspectives and see different kinds of research projects.” Phillips continued. This student-run conference is made possible thanks to the support of HSS Dean Boreen, Provost Cook, SUUSA, and Languages and Philosophy. For more information on SUU’s Philosophy program, visit their website.